(246)PAMPHLET: 1930's Modern Household Hints-Condition: Very Good. Pamphlet intact, has one page with paragraph cut out. 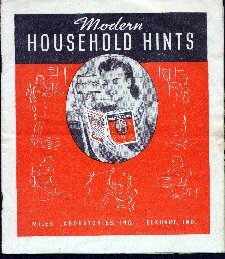 Wonderful hints for the Happy Homemaker of the 30's including hints on cleaning, doctoring etc. Put out by Miles Laboratories, and includes full page ads for Alka Seltzer and Dr. Miles Nervine. Size is approx. 6" x 8" with 8 pages. Price: $7.00 + shipping.